An author, a professor and a filmmaker discuss their unique takes on gentrification. Explore the challenges, the benefits and consequences of Gentrification from unique and differeing points of view. Explore the challenges, benefits and consequences of gentrification with Shukree Tilghman. What do you hear when people talk about gentrification? How can we better improve a neighborhood's economy without displacing residents? User the hashtag #WhatIHearPBS to share your thoughts. 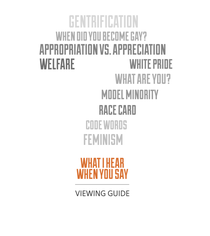 Dig deeper into the conversation with a detailed Viewing Guide: What I Hear When You Say: Gentrification.